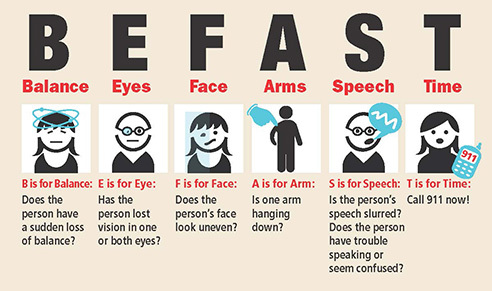 In culmination of World Stroke Day, we wanted to be sure you had the tools necessary to recognize a stroke and the signs to look for. Following these easy steps could help save a life!!!! The B.E. F.A.S.T. guideline helps you remember that timely treatment is the key to saving someone’s life or quality of life. B – Balance: Is the person experiencing a sudden loss of balance or coordination? Strokes cause about one out of every 19 deaths in the U.S. each year, making it the third leading cause of death for women and the fourth leading cause of death for men. Strokes are also a leading cause of serious long-term disability in America. A stroke occurs when a vessel in the brain is blocked by a blood clot or ruptures, according to the American Stroke Association. About 15 percent of all strokes in the U.S. are hemorrhagic, leaving 85% to be ischemic. The Centers for Disease Control and Prevention (CDC) says high blood pressure, heart disease, diabetes, cigarette smoking, atrial fibrillation are risk factors for stroke. Eating a healthy diet rich in fresh fruits and vegetables and low in sodium and trans fat. Staying physically active each day. Preventing or treating high cholesterol, high blood pressure, or diabetes. If you think someone has suffered a stroke, call 9-1-1 immediately. Paramedics can begin life-saving treatment on the way to the emergency room.